The Islamic Caucasus Emirate, an al Qaeda-linked group that operates in southern Russia, confirmed today that its emir, Doku Umarov, has died. Although Umarov was rumored to have been killed by Russian security forces late last year, the reports have not been confirmed until now. “The Command of the Caucasus Emirate officially announced the martyrdom of the Emir Doku Abu Usman [Umarov],” according to statement that was released today on Kavkaz Center, a media outlet for the Islamic Caucasus Emirate. The Islamic Caucasus Emirate did not say how or when Umarov was killed, and the martyrdom statement provided only a brief biography. Umarov had been reported killed several times over the years, only to re-emerge. Umarov was first reported killed in a statement on Dec. 18, 2013 by Ramzan Kadyrov, the President of the Chechen Republic. But one day later, a video showing the Islamic Caucasus Emirate leader was uploaded to YouTube. Today, Kavkaz Center tweeted that Ali Abu Muhammad, the “Caucasus Emirate’s Sharia Judge,” was “elected as new CE Emir by leaders of CE provinces.” A video of of Abu Muhammad was also released by the Islamic Caucasus Emirate on Kavkaz Center. 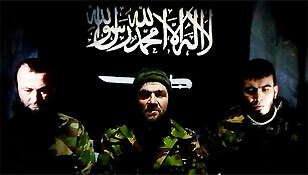 Umarov had led the jihad in the Russian Caucasus since he declared the establishment of the Islamic Caucasus Emirate in November 2007. He admitted to planning and executing numerous terror attacks in the Caucasus and in Moscow, the Russian capital. The US added Umarov to its list of Specially Designated Global Terrorists in June 2010. The Islamic Caucasus Emirate was added to the US’ list of global terrorist groups the next year. Umarov also said his group is “part of the global jihad,” in a July 2013 statement in which he called for further attacks aimed at disrupting Russia’s plans for the 2014 Winter Olympic Games in Sochi. Although the Islamic Caucasus Emirate failed to launch attacks in Sochi during the Olympics, the group executed three suicide attacks on transportation targets in Volgograd (formerly Stalingrad) in the months leading up to the games. The Islamic Caucasus Emirate has close ties to al Qaeda. Some members of the group have fought in Afghanistan and Pakistan. And the International Islamic Battalion, the unit comprised of Arab and other foreign jihadists that fights in the Caucasus, has been led by senior al Qaeda leaders. The top leaders of the International Islamic Battalion have included al Qaeda commander Ibn al Khattab (killed in 2002); Abu al Walid (killed in 2004); Abu Hafs al Urduni (killed in 2006); and and Muhannad (killed in April 2011). Large numbers of fighters from the Islamic Caucasus Emirate are currently battling alongside the Al Nusrah Front for the People of the Levant, al Qaeda’s affiliate in Syria, and the rival Islamic State of Iraq and the Sham. According to some reports, Umarov died from poisoning. Others say he was wounded in a spetz-operation and died later. Who knows, looks like the Russians stepped up efforts to kill him prior to Sochi. I doubt Russia will ever possess the capacity to say they conducted an average of 300 low-impact direct action SOF night raids a month in Afghanistan alone (not OIF), targeting bad guys far worse than Doku Umarov. And speaking of Ole Ivan, their “blows” to “chechen wahabis” aren’t really effective if these terrorists are still finding their way to Iraq, Afghanistan, Pakistan, Uzbekistan, Libya, Syria and most importantly, America (see: Boston Marathon Bombings) to wage war on recognized national governments and their inherent population. I mean, Long War Journal just published a dispatch which asserts the belief of American intelligence community that only a negligible amount of approx 50 traitorous clowns are fighting in Syria. How many do Chechens do you think are fighting there? That would be very interesting seeing as how that is how they got Khattab previously. Fool me once, shame on you. Fool me twice, won’t get fooled again!